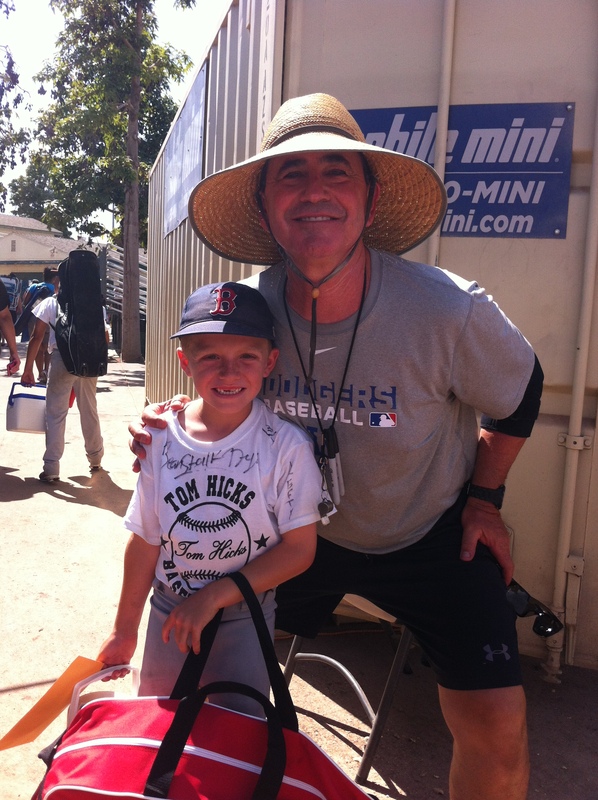 T attended one week-long session of the Tom Hicks Baseball Camps for the first time last week. 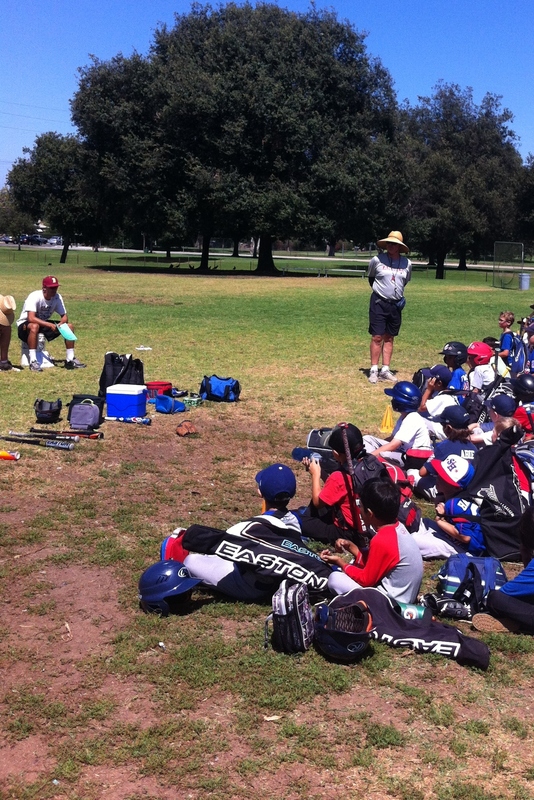 This is a Long Beach (CA) area day camp for baseball-loving boys and girls ages 5-to-14 of all abilities and skill levels. But make no mistake. This camp is not for everyone. Well, not every parent anyway. 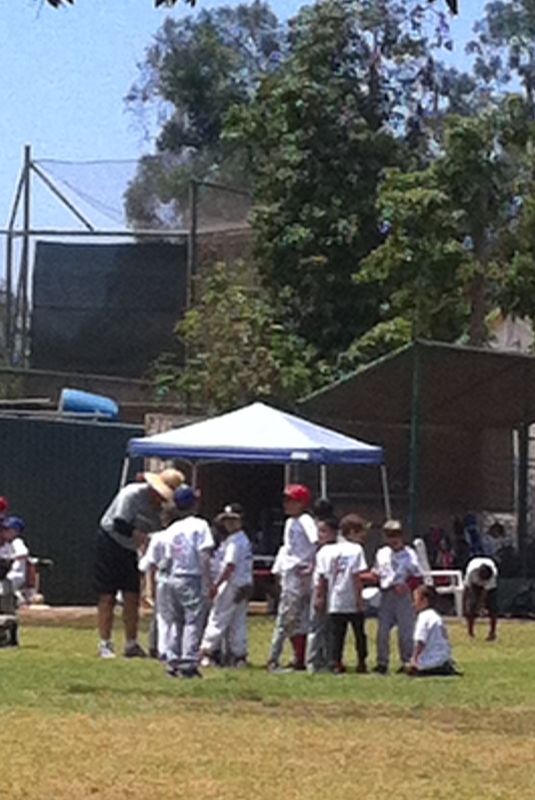 “Grandpa” wraps up another fun day at Tom Hicks Baseball Camps. How do I explain this… “Grandpa” – as the players (campers) and coaches (staff) warmly and respectfully refer to Hicks in day-to-day interaction – is old school. Some background: Grandpa was born and raised in Long Beach and played his high school ball at Millikan from 1972-74, and he was a playing member of USC’s National Championship Team back in 1978. Those years precede the year of many of the parents’ birth dates of the players we spent time with last week; I personally can say both C and I were born in the former time period and I spent the fall of 1978 in Kindergarten myself. 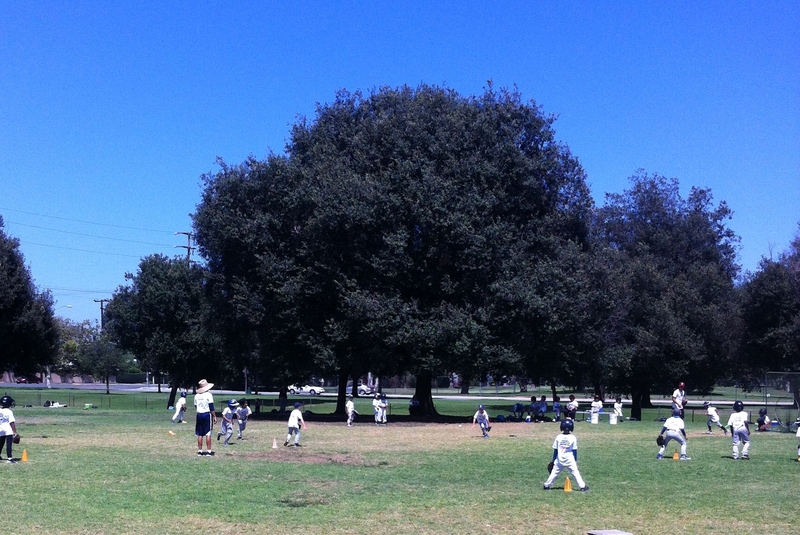 And Grandpa has been playing and/or coaching baseball in some form or fashion going on five decades now, including founding his camp in the summer of 1989 here in Long Beach, where it has remained since. You can read more details about Grandpa’s background as a sportsman, father, educator, and public speaker here. Grandpa explains that touching another player other than a high-five is not OK. He models this by showing that tapping another player on the helmet is not OK behavior. As a camp director, Grandpa is firm, fair, and fun. The structure of this camp is much like how a school runs (his analogy): Consider Grandpa the principal, the Coaches the teachers, and the players the students. On Monday mornings each new week of camp (there were five, week-long camp sessions in 2015), Grandpa asks that all students – err, players – and their families to please arrive by 8:30 a.m. so they have enough time to check in and convene for a 20-minute orientation. At this time camp Grandpa states the camp’s rules and explains any potential consequences that may come from not following said rules for all to hear and understand. This includes such mandates as no cursing (grounds for a phone call home to a parent) and equal respect of all fellow players, however big or small, whether a boy or a girl. Grandpa uses many listening tricks to keep the kids engaged, such as asking them to take their hats off and hold them in their laps at an intermittent time, and later on he asks the kids to put the hats back onto their heads. By doing small and simple tests like this, Grandpa knows who is listening (or not) just by looking out over the crowd of campers. 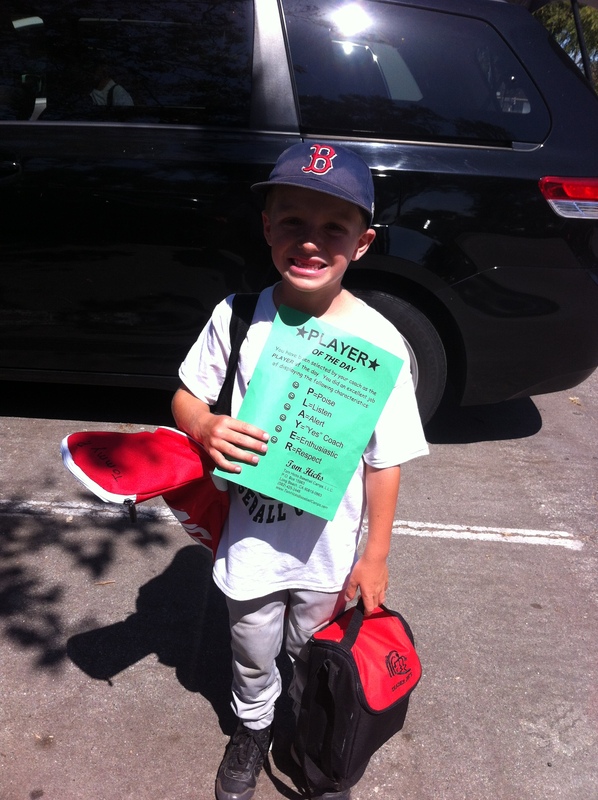 By Wednesday morning of his week at Tom Hicks Baseball Camps, and since we always seemed to arrive a little earlier than anticipated, T decided to use the extra time to step up and help collect lunches from the other players as they arrived. By the way, it’s important to note that Grandpa advertises his camp time as 9 a.m.-to-3 p.m., and it’s even more important to clarify that this means Grandpa starts the camp day promptly at 0900. Even on days other than Mondays you’ll want to arrive to the park about 15 to 20 minutes before so you can find a place to park the car and walk your player in so s/he has ample time to greet Grandpa (I’ll get to that in a moment), drop off their lunch, place their gear neatly in their team dugout, top off their water bottle, and then have a minute or two to settle down into their team line by 8:58 a.m. in an orderly fashion. 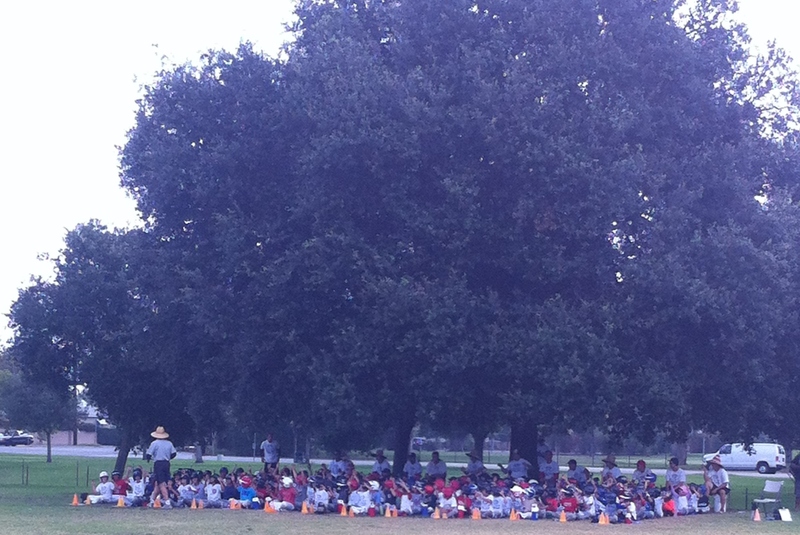 What the start of each morning of Tom Hicks Baseball Camps looks like. Without fail. 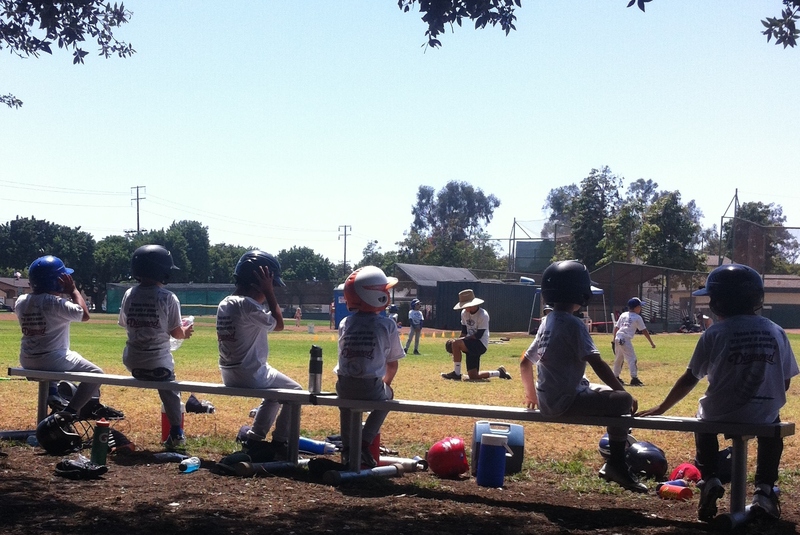 This is what benches and dugouts look like during scrimmages at Tom Hicks Baseball Camps: No bats in hands, kids seated, and gear nearby at the ready. At 9 a.m. sharp, Grandpa expects a few things from his 170 or so players and coaches: Straight lines (there are ropes anchored end-to-end on the ground and cones marking out each team so there’s no room for error), no speaking unless spoken to, and active listening (meaning, speaking when spoken to). And hey, guess what? The kids can do it, even the five-year-olds! How? The kids are never asked to sit for too long of periods in any given situation. There are frequent interruptions of calisthenics, cheers, and other chants between the periods of seated instruction. Also, no one ever walks anywhere, not even the coaches. The name of the game is hustle. In fact, there’s a “Hustler of the Day” award so that particular characteristic is being watched closely by Grandpa and the coaches of all the players all day long. Of course, in addition to all of this, there are drill and skill rotations, mock games and scrimmages, and scheduled and routine water, snack, and lunch breaks to balance out the six-hour day. T is about to field a ball at Shortstop and make an out at second base during one of his scrimmages with Tom Hicks Baseball Camps. I arrived just in time to see it. 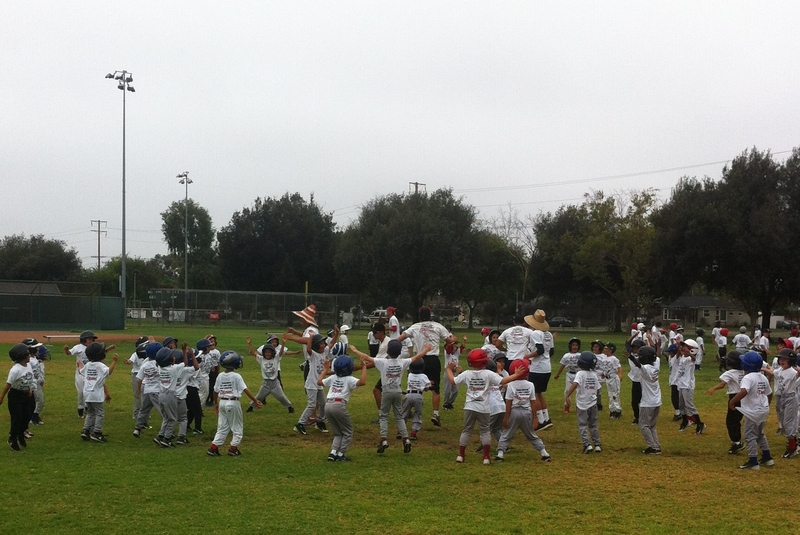 One of the crazy calisthenics sessions out at Tom Hicks Baseball Camps. It appears chaotic in person also, but it’s actually organized enough to work for this age group, and that’s all that matters. T in ready position in Right Field. 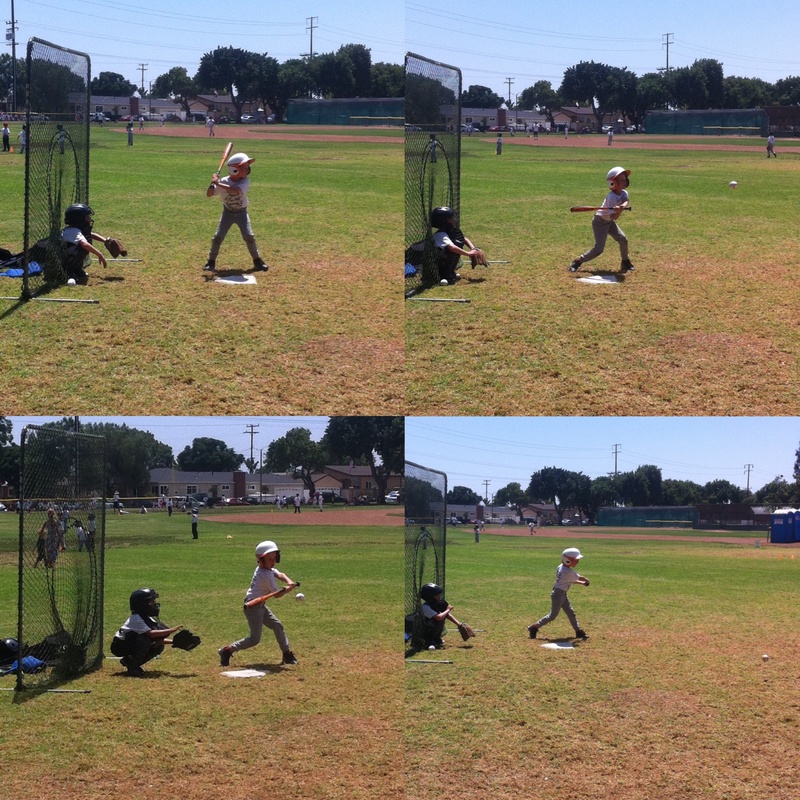 The kids rotate between most defensive positions and even take turns riding the pine at Tom Hicks Baseball Camps. Teamwork, y’all! Many reading this may be left wondering who in the heck would want to send their kids to this overly structured camp and what kid would ever want to return to this experience. It sounds like baseball boot camp, quite army-like, doesn’t it? Well, yes, yes it is. But that’s not necessarily a bad thing if you listen to the kids themselves. Out of the mouths of babes and in T’s own words after asking how the first day of camp went, he said, “Grandpa is strict, but I had a lot of fun!” Other parents and grandparents I spoke with over the course of the week echoed similar feedback from their kids and grandkids, and many of those kids are now in their fifth year (or more) of this camp and attend multiple weeks each season. I also never encountered nor overheard one naysayer in the bunch the entire week, and that’s even more telling. It was so cool to see the players run up to Grandpa Tom for him to sign their camp shirts on Friday during lunchtime. Coaches signing the players’ camp shirts is a longstanding camp tradition on the final day of each week at Tom Hicks Baseball Camps. 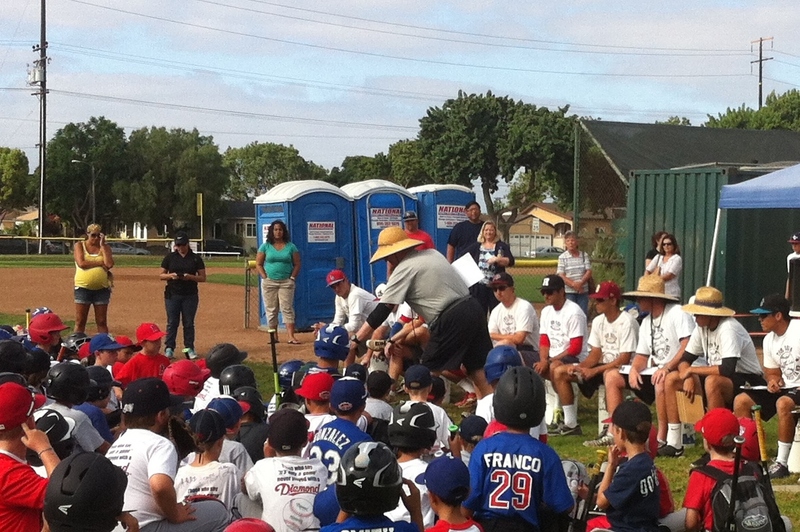 Another component to this camp is that Grandpa promotes teamwork to the core and rallies fiercely against entitlement (you can reference this article as to why Hicks specifically focuses on this at a baseball camp). For Grandpa, anti-entitlement behavior begins with his staff and himself modeling manners and common courtesy to all of his players throughout the week at every turn. That starts right away each morning when Grandpa’s out front greeting each and every camper as they arrive. He greeted us daily with an enthusiastic, “Hello!” or “Good morning!” and you better believe it was not just good manners but expected that you acknowledge Grandpa back similarly. In fact, one day, I witnessed one player walk by without acknowledging Grandpa’s greeting, to which under his breath Grandpa basically had the entire conversation with himself, “ ‘Good morning, Grandpa! How are you?’ ‘Oh I am fine, (insert name of player here – FYI, Grandpa by day two somehow knows all the kids’ names, so fair warning), thanks for asking!’” I couldn’t help but chuckle to myself when he did this, because he basically was just saying aloud what anyone (with manners) might think in a situation like that. 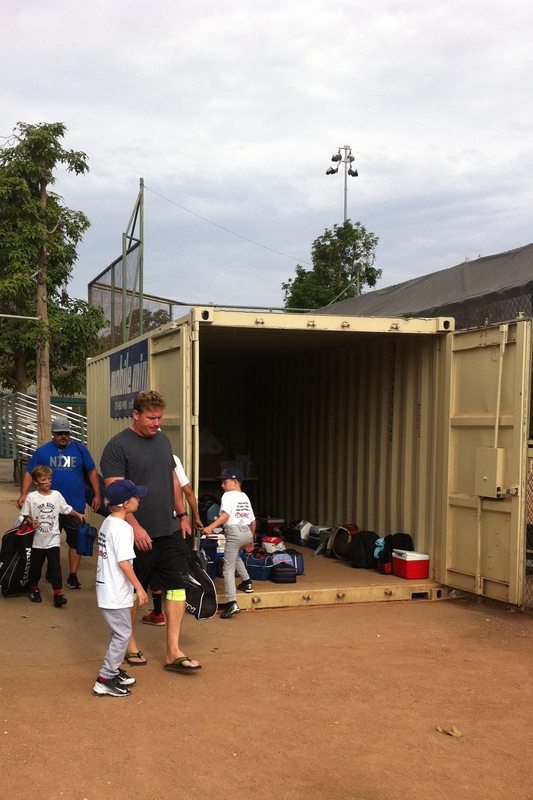 At the end of each day at Tom Hicks Baseball Camp, Grandpa re-distributes lost gear back to players. Players are also expected to say thank you, whether it’s to the volunteer taking their lunch each morning or to him personally when he hands back a piece of misplaced gear at the end of the day (the lost-and-found sessions at the end of each day are priceless and painfully honest – “There’s hundreds of dollars of gear up here!” “Parents, names really do help us out, thanks so much!”). Coaches use pleases and thank-yous on the regular also. Through all of this modeling, kids here learn quickly that back-talk is not tolerated nor is any other disrespect of another player, volunteer, or adult, including their own parent. In fact, one morning Grandpa called out one player for not responding to his mother in kind or at minimum saying goodbye to her after she said, “I love you! Have a great day!” Again, I had to stifle my laughter (and way to go, Grandpa!). On Tuesday last week, T and about 20 or so other players received the coveted “Player of the Day” award. Only one or two players on each team earn this award daily. My “Player of the Day” every day of the year. 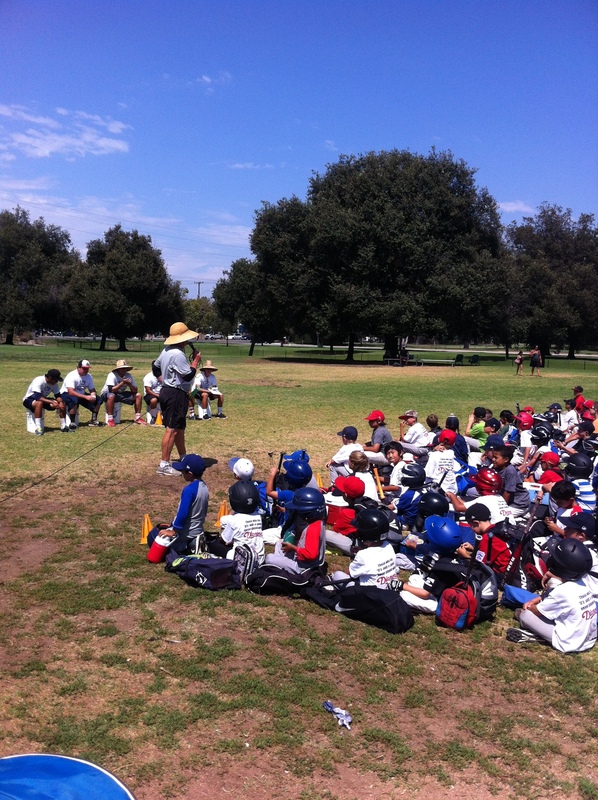 Thanks Tom Hicks Baseball Camps! However, just as quick as Grandpa and other coaches may correct a player or place them in a time-out to reconsider a not-so-good choice, they’re as much if not more likely to reward positive behaviors, hard work, and good efforts. It may be something as small as a Red Vine spontaneously during the day for helping a coach move large equipment from one area to another. Or praise might come in the form of being presented an award at the end of the day in front of all the other campers. Such awards highlight anything from overall Player of the Day (a team player award to one or two players per team daily) to Hardest Working Camper of the Day (whole camp award). Trust me: Those awards are earned, not given. Oh and fair warning, not every player receives a trophy or award at this camp either. OK, you can pick your jaw up off the floor now… or you can raise your hands up and shout a woot-woot right along with me. Big thanks to Grandpa and all of the Tom Hicks Baseball Camp coaches for a firm, fair, and fun week at Heartwell Park. Our family is grateful that such a program exists in this day and age. 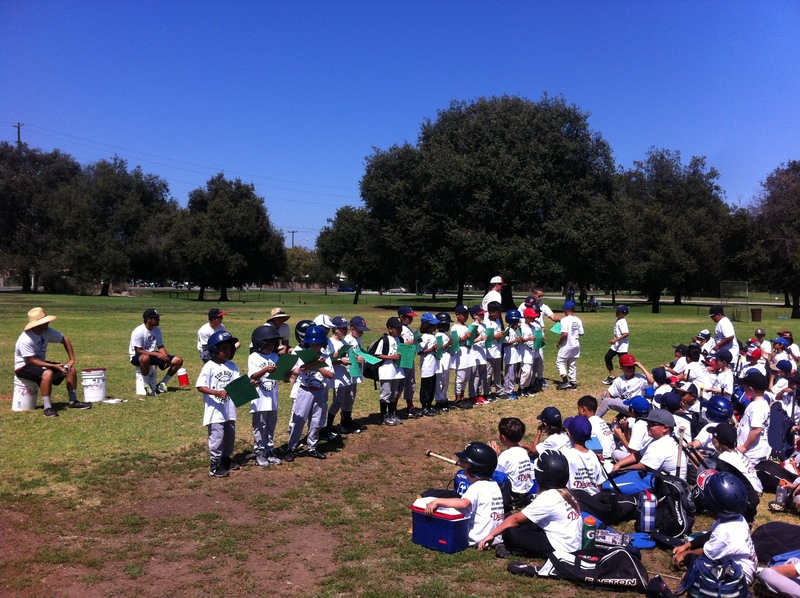 T learned a lot not just about baseball but also about teamwork, perseverance, and camaraderie. He’s already looking forward to going back next summer for a couple (or all five) weeks. 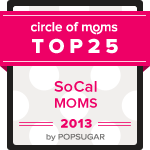 I can’t rave about or recommend this camp enough (again, woot-woot!). Emptied your summer bucket lists yet, RMT’ers? If yes, go here for more than 50 ideas to fill up the rest of the season. And there’s even time for the kids to catch a week or two of camp before school starts back up if you’re just too exhausted to do much else with or for them. Check out my list of camps around Long Beach (CA) here. 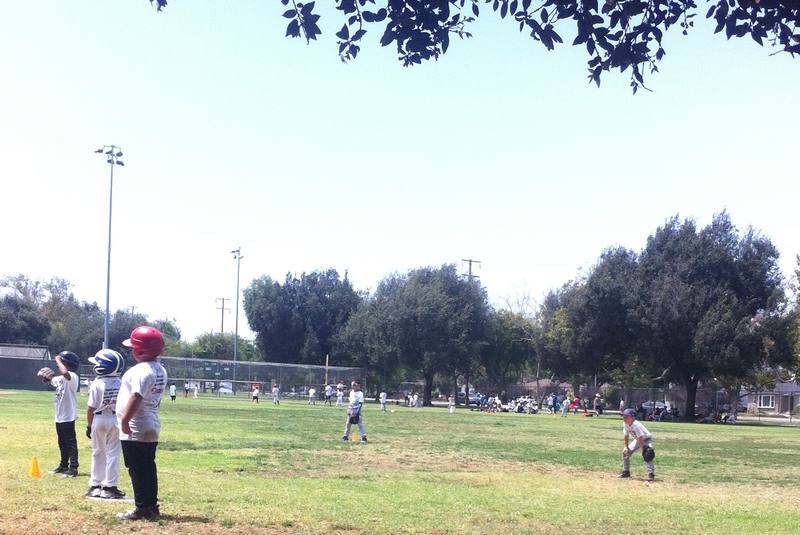 This entry was posted in Educational, Entertainment and tagged baseball, daycamps, discipline, Grandpa Tom, long beach, manners, non-competitive, summer, Summer Camps, teamwork, Tom Hicks, Tom Hicks Baseball Camps, youth sports. Bookmark the permalink.